The second week of August is characterised by a rather sluggish start as the economic calendar is relatively boring and most of the sensitive data have already found their way to the market. So, the first marked miss in Eurozone’s macroeconomic statistics happened in the German manufacturing sector – output fell by 1.1% in June after rising for five consecutive months. The median forecast was at 0.2%, which, together with the pace of construction which slowed down by 1% in the same month, indicates a slowdown in economic activity in the leading economy of the eurozone. Data is likely to be a signal for caution for euro buyers before the release of the report on GDP in Germany in mid-August. The common currency, however, does not simply give up, gripping an edge against the dollar. A strong payrolls report was a rather unexpected start for US statistics in August, as it ran counter to other indicators that indirectly indicated the weakness of the labour market. The number of jobs increased by 208K, wages by 0.3% tallying with the forecast, and unemployment fell to 4.3%, reviving hopes for a third Fed rate increase this year. Futures on the rate estimate the probability of a December increase in 47.0% compared to 42.8% last week. The dollar won back losses against most of the majors, but the lagging buoyancy for the European economy provides strong poise for EURUSD, which, however, only increases the probability of continuing Friday’s correction to the level of 1.17. The British pound showed indifference to the sensitive data on household spending in the UK. The Markit report published on Monday showed that consumption, a key component of GDP, declined for the third consecutive month, showing the worst dynamics since 2013. The positive background for the pound, taking into account economic data and details by Brexit, is becoming more and more precarious, so with the growth of the dollar, the GBPUSD pair may adjust to the level of 1.29 this week. The dynamics of oil prices is becoming increasingly ambiguous as the fundamental background is equally filled with both positive and negative components. On the one hand, there are falling inventories in the United States, Saudi Arabia’s export cuts in August, CFTC data, indicating a net gain in long positions. On the other hand, there are problems with the commitment to OPEC quotas, output growth in Libya and Nigeria, the uncertainty of the policy of shale companies in the United States. Contango market with prices above $ 50 is definitely a favourable environment for expanding the production of American firms, so this negative factor will definitely manifest itself. Today, prices fell by 1% under pressure of uncertainty before the OPEC meeting. The efforts of Saudi Arabia and the likelihood of a positive outcome of the meeting will probably bring prices for a little more than $50. On September 24 this year, German citizens will head to the polls to elect the nation’s Bundestag, or lower house. Incumbent Angela Merkel of the Christian Democratic Union of Germany (CDU) is running for fourth time, this year against, Martin Schulz of the Social Democratic Party. But there is also another player in the electoral race, the populist Alternative for Germany (AfD), which has entered Berlin’s state parliament, and now holds seats in 10 out of Germany’s 16 regional assembles. How does the Election work? Germany’s voting system combines elements of both direct and proportional representation. The ballot contains two votes: one for a candidate and one for a party. In the first vote, voters will choose their favourite candidate to represent their district in the parliament and in the second vote, they vote for a political party. Interestingly, voters can split their vote amongst parties. For example, one may cast their ballot for their local Christian Democrat candidate in the first vote and vote for the Green party in the second vote. Undoubtedly, the key themes of this year’s elections are national security and immigration policy. Merkel has often been criticised by nationalist groups for her liberal approach to immigration. Populist candidates, including the far-right Alternative for Germany are expected to gain ground in the election and any signs of Merkel losing power may cause a market backlash and may also severely hit the Euro, European stocks and other assets with exposure to the European market. A Merkel loss could open the door to the rise of a new, Eurosceptic government and exacerbate the already tense relationship with Trump – especially if Schulz wins. If one thing is certain, is that the German populist movement is rising in the wake of migrant crisis, and can pull votes from mainstream parties including the CDU and the SPD. All in all, the German election race is currently in ‘flux’ and the results remain mired in uncertainty. The German election marks the conclusion of a historic and market-moving electoral cycle in Europe. Get ready to take advantage of the trading opportunities arising from another market-shaking event and benefit from Tickmill’s competitive trading conditions. The focus today will be on the UK as the European day starts with the country’s employment data. 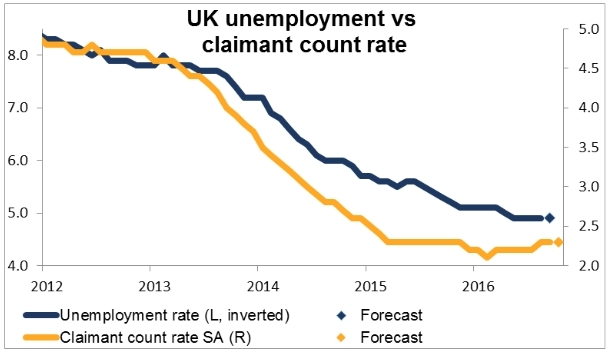 The report is not likely to move the needle either way however as both the claimant count rate and the unemployment rate are expected to remain the same (the former for the third consecutive month, the latter for the fifth consecutive month). The jobless claims rate, analogous to the US weekly jobless claims, is expected to be slightly higher but nothing dramatic. In short, the data are likely show the UK employment situation is steady. That’s actually not a bad outcome, given that survey measures of hiring intentions have been fairly weak and of course the economic picture has been uncertain since the Brexit referendum. If the data come in as expected, the currency is likely to be steady too. US industrial production is forecast to rise a bit after two relatively weak months. This would be consistent with the increase in the average workweek and the rise in the ISM manufacturing index. The rise in the rig count also suggests that oil & gas production is increasing. 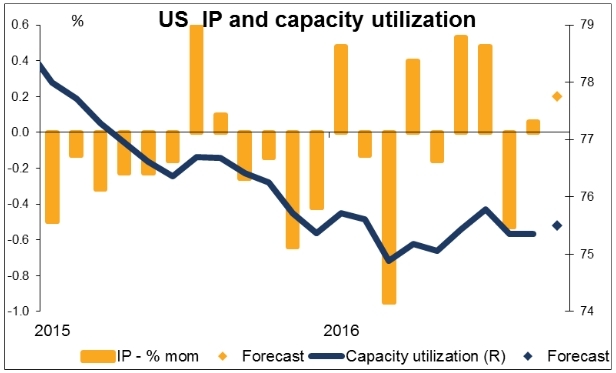 Signs that US output is picking up and capacity utilization is increasing should add to the optimism about economic growth and future inflation that yesterday’s better-than-expected retail sales and Empire State manufacturing index engendered and be USD-positive. 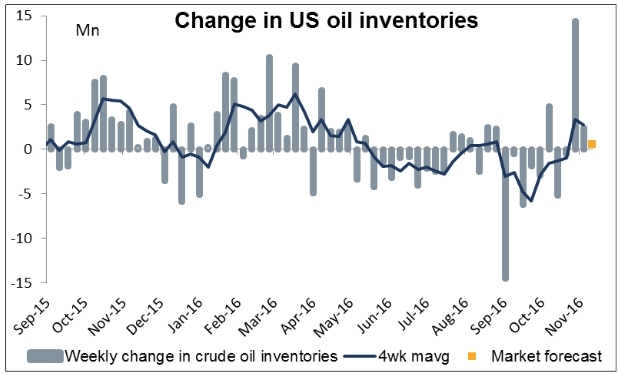 The relatively small rise in US oil inventories that’s expected could be positive for oil, but I’d assume the price will be affected more by any further comments about the possibility of reaching an agreement at the Nov. 30th OPEC meeting. Finally, the Australian unemployment rate is expected to rise even as the number of people in employment rises as well. That’s because the participation rate is expected to rise too. 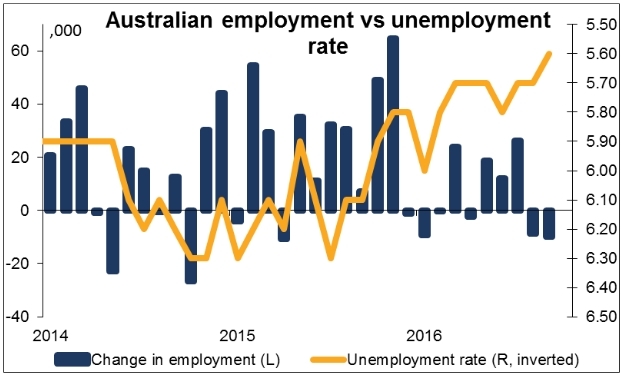 In that case, the rise in employment should be more important than the rise in the unemployment rate and the number could even be positive for AUD, although I wonder if market participants reacting quickly to a figure flashing up on the screen will be so analytical. The US dollar remained in demand on Thursday following yesterday’s dramatic move that saw the greenback more than reverse its losses from the brief election sell-off. Equities also continued to benefit from the recovery in risk appetite but the sell-off in government bonds extended into today’s European session. Risk sentiment has been improving since US President elect Donald Trump’s acceptance speech on Wednesday where he promised to boost growth and increase spending on infrastructure. The prospect of a fiscal stimulus in the US has led to a surge in government bond yields and measures of US inflation expectations to edge up. The yield on 10-year US treasuries rose above 2% for the first time since March and hit the highest since January. Other sovereign bond yields such as those for Germany and Japan also headed higher, while demand for other safe havens such as gold fell. The precious metal is down about 5% from its post-election spike and last stood at $1266 an ounce. The dollar meanwhile was eyeing the 107 level against the yen as it extended its gains to 106.94 yen in late European session. The greenback has been boosted by expectations that a Trump presidency would be positive for economic growth and inflation. A looming Fed rate hike, most likely in December, is also spurring the US currency. The odds of the Fed increasing rates in December, as implied by Fed Fund futures, briefly tumbled after the panic selling that followed the emergence of Trump as the winner of the US election, but they’ve since rebounded as the market volatility has eased. In other currencies, the euro slid to two-week lows as it broke below 1.09 dollars to stand at 1.0865 in late European session. The pound had a better session as traders speculated that the UK would be able to get a better trade deal with the US under Trump once it leaves the EU. This helped sterling firm to 1.2477 dollars in late trading. The risk-on mood did not extend to commodity currencies as the Canadian, Australian and New Zealand dollars sagged. The Canadian dollar, along with the Mexican peso, remained under pressure from the US dollar as investors worry about the possible implications of a Trump win on trading relations between the countries. The greenback climbed to near 8-month highs at around 1.35 versus the loonie in late session, while the Mexican peso was headed back towards yesterday’s all-time low of 20.77 per dollar. The Australian dollar was 0.6% lower at 0.7590 despite commodities such as iron ore and copper rising sharply. The New Zealand dollar fared even worse, tumbling over 1% to 0.7185 after the Reserve Bank of New Zealand cut interest rates by 25 bps earlier today. 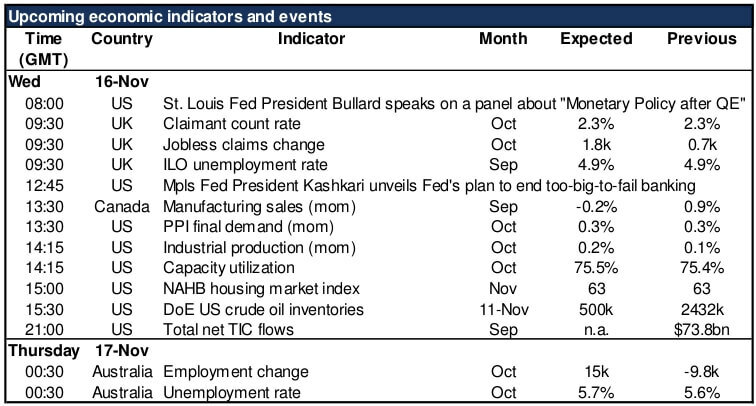 It was a very light day for economic data with the only major release being the weekly jobless claims out of the US. Jobseekers claiming benefits in the US last week rose by 254k, which was below expectations of 260k, pointing to another solid week for the American jobs market.